Although it is pretty well-known around the world that Toyota is definitely leading the way in terms of the hybrid vehicle segment, but did you know that the automotive manufacturer is actually also producing one of the most powerful, efficient pickups? The 2015 Toyota Tundra Brampton ON is available at Attrell Toyota and it is is dressed to impress. It comes in nine different colors and is available with heated, leather seats to make things as comfortable as possible, no matter the journey ahead. The 2015 Toyota Tundra is one of the best full-size pickup trucks you will find out there, especially for the price. (It has a starting MSRP of $27,820) Trust us when we say you will be hard-pressed to find a vehicle with better features, a more efficient engine and all for a lesser price. See all of the trim levels and colors available today at Attrell Toyota by viewing our online inventory! Equipped with a 5.7L V8 engine, the 2015 Tundra can pretty much handle anything. The V8 engine makes up to 381 horsepower and gets up to 15.9 L/100KM in the city and 12.3L/100KM on the highway. When put to the test, the 2015 Tundra maxes out at a towing capacity of 4,760KG, meaning it can tow two Tundra’s behind it. The maximum payload reaches 855 KG. The 2015 Tundra can be equipped to fit up to five people, which means you don’t have to worry about figuring out ways to carpool. 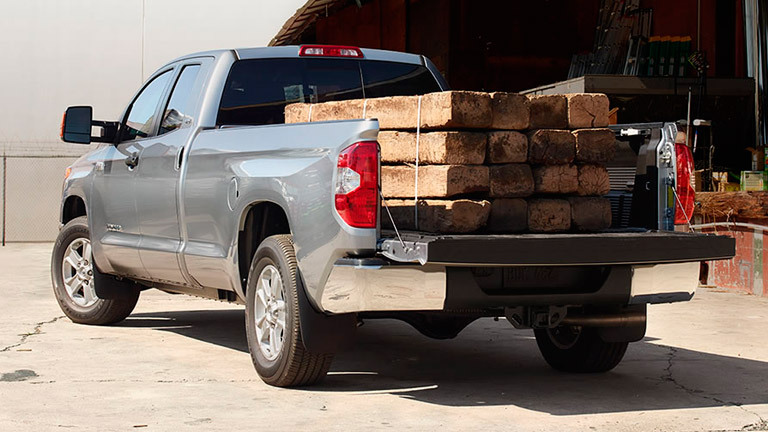 The 2015 Toyota Tundra is a great option for drivers who want a high-tech pickup that pulls out all of the stops in terms of power and capabilities. The standard front double wishbone type suspension with gas shock absorbers provides an incredibly smooth ride wherever you travel, and the 6-speed automatic transmission lets drivers smoothly switch between gears without even having to worry about it. Get the 2015 Toyota Tundra Brampton ON today at Attrell Toyota! Even the most basic Toyota Tundra trim level comes equipped with enough available fun features to get the whole family excited, including a rearview backup camera, a touchscreen display system, tow hooks and a trailer hitch receiver. The 2015 Toyota Tundra also comes in a Western-themed 1794 model, which is full of wooden accents, tan leather seating and a center and shift console full of matching soft-touch materials. Drivers love the fact that the 2015 Tundra is extremely easy to handle, even if it is extremely powerful. It is also super versatile and the seats can be maneuvered to fit a large amount of cargo. Some of the other features that drivers really love about the 2015 Toyota Tundra include a center-mounted 3.5-inch multi-information display screen, automatic climate control, a center console that has enough room for a laptop and an elite audio system. You can test drive the 2015 Toyota Tundra today at Attrell Toyota!